Electrophysiological mapping and ablation techniques are increasingly used to diagnose and treat many types of supraventricular and ventricular tachycardias. These procedures require an intimate knowledge of intracardiac anatomy and their use has led to a renewed interest in visualization of specific structures. This has required collaborative efforts from imaging as well as electrophysiology experts. 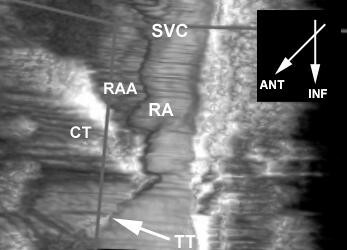 Classical imaging techniques may be unable to visualize structures involved in arrhythmia mechanisms and therapy. Novel methods, such as intracardiac echocardiography and three-dimensional echocardiography, have been refined and these technological improvements have opened new perspectives for more effective and accurate imaging during electrophysiology procedures. Concurrently, visualization of these structures noticeably improved our ability to identify intracardiac structures. The aim of this review is to provide electrophysiologists with an overview of recent insights into the structure of the heart obtained with intracardiac echocardiography and to indicate to the echo-specialist which structures are potentially important for the electrophysiologist. During the last two decades revolutionary diagnostic and therapeutic changes were implemented in the management of patients with arrhythmias. The development of transcatheter ablation provided a curative treatment of most supraventricular tachyarrhythmias including atrioventricular (AV) and AV nodal reentry tachycardias and more recently atrial flutters. Life threatening ventricular arrhythmias are effectively palliated by implantable anti-tachycardia devices and conduction disorders treated by pacemakers, with instantaneous improvement. New challenges are the effective treatment of patients with atrial fibrillation, which is the most frequent and often disabling arrhythmia and the curative treatment of patients with life threatening arrhythmias. The development of novel ablative procedures are currently being investigated but the success rate still remains suboptimal. Since the arrhythmia substrate is frequently associated with certain anatomical structures or morphological variants, improved imaging has increasing role in the improvement of these treatments. Furthermore, novel catheter ablation approaches require catheter placement to sites, which may be associated with increased complication risk. Therefore imaging has a crucial role both in guiding and improving safety of electrophysiology (EP) procedures. Also, thromboembolic risk stratification, fine-tuning of the implanted sophisticated devices require advanced and effective imaging techniques as does their follow-up. Electrophysiological mapping and ablation techniques are increasingly used to diagnose and treat many types of supraventricular and ventricular tachycardias. These procedures require an intimate knowledge of intracardiac anatomy and their use has led to a renewed interest in visualization of specific structures [1–3]. This has required collaborative efforts from imaging as well as electrophysiology experts. Classical imaging techniques may be unable to visualize structures involved in arrhythmia mechanisms and therapy. Novel methods, such as intracardiac echocardiography and three-dimensional echocardiography, have been refined and these technological improvements have opened new perspectives for more effective and accurate imaging during electrophysiology procedures [4–8]. Concurrently, visualization of these structures noticeably improved our ability to identify intracardiac structures. The aim of this review is to provide electrophysiologists with an overview of recent insights into the structure of the heart obtained with intracardiac echocardiography and to indicate to the echo-specialist which structures are potentially important for the electrophysiologist. Clinical electrophysiology requires invasive procedures since the definitive diagnosis is nearly always made in the EP laboratories immediately followed by curative treatment. This approach requires an imaging technique, which can be comfortably used over a long time period without extra cost and personal. It should increase diagnostic accuracy and decrease the risk for complications. Intracardiac echocardiography (ICE) fulfills most of these criteria. Recently, two ICE systems became available for interventional EP labs: mechanical and phased-array transducers. The mechanical intravascular ultrasound imaging and ICE system (ClearView, CardioVascular Imaging Systems Inc, Fremont, CA) is an 8F sheath-based catheter that incorporates a 9 MHz beveled single-element transducer rotating at 1800 rpm (model 9900, EP Technologies, Boston Scientific Corp., San Jose, CA, USA). The catheter is equipped with a 1-cm long sonolucent distal sheath with a lumen housing the imaging transducer. The sheath prevents direct contact of the rotating transducer with the cardiac wall. The ICE catheter is filled with 3–5 cc sterile water and then connected to the ultrasound console (model I5007, Boston Scientific Corp., San Jose, CA, USA). This catheter obtains cross-sectional images perpendicular to its long axis. The catheter is relatively simple in its design and the data acquisition allows three-dimensional reconstruction. The other available system is a 10 F catheter-based phased-array transducer operating at 5.5 to 10 MHz frequency and has also Doppler capabilities (Acuson Corporation, Mountain View, California). The 64-element phased-array allows scanning a longitudinal 90-degree sector image with a radial depth penetration of 4 cm. This catheter does not permit three-dimensional reconstruction in its present form. On the other hand it is a steerable catheter with excellent depth penetration (12 cm) allowing visualization of left-sided structures from the right side of the heart, which is a major advantage in clinical electrophysiology. Advances in microprocessor technology, have made three-dimensional (3D) echocardiography a practical imaging modality providing cardiac structure imaging in their realistic forms, which helps to understand complex pathology and to reduce interpretation variability. Two different approaches are followed in 3D echocardiography: 3D reconstruction using a sequence of appropriately timed two-dimensional images and real-time volumetric imaging. Currently, automated contour analysis allows to measure and monitor global ventricular as well as regional function. For 3D reconstructions from intracardiac images, a custom-designed pullback device for the mechanical ICE transducer is used. This device is controlled by the 3D workstation and uses a stepping motor to move the catheter stepwise and linearly in a cephalic-caudal direction through the right atrium. The workstation receives video input from the ICE system and both an ECG- and respiration-signal (impedance measurement) from the patient. Prior to the acquisition run the range of RR- and breathing intervals are measured to calculate their mean value from the upper- and lower-limits. Cardiac cycles are recorded and those that fall within the preset limit (± 10%) around the mean interval are further processed. The workstation starts acquisition of 2D images after detecting the peak of the R-wave and in the same phase of respiration, at a speed of 25 images/ sec (image interval 40 ms), stopping after 1000 ms or after detecting the peak of the R-wave of the next cardiac cycle. After acquiring one cardiac cycle in the preset ranges, the workstation stores the images in the computer main memory, and the catheter is then pulled back by an 0.5-mm axial increment. If the acquired beat falls outside the preset ranges, the ICE transducer is left at the same position and a new cardiac cycle is acquired. This process is repeated until the level of the inferior vena cava (IVC) is reached. Clearly, the acquisition time is much shortened when all cardiac cycles are of the same length. Therefore, in practice the right ventricular apex is paced at 100 bpm. In accordance to their timing in the cardiac cycle, all the individual images of each cardiac cycle are formatted in volumetric data sets (256*256*256 pixels/each 8 bits) with 40 ms intervals allowing the display of dynamic 3D imaging. During post-processing, several algorithms are applied to reduce noise, enhance edges, and reduce spatial artifacts (ROSA filter). During ICE guided EP procedures, the EP catheters are continuously manipulated in three-dimensions, and the acqusition of the images for 3D reconstruction takes time. Real-time three-dimensional echocardiography, therefore, offers advantages. The volumetricsR ultrasound system generates real-time three-dimensional pyramidal scanning using a matrix array of 512 crystals. The scanner uses 16 parallel receive channels to generate B-mode images up to 60 volumes per second. Each image plane can be inclined at any desired angle. The LIVE 3D system uses matrix array with 3000 individual transducers and the system displays real-time images. These systems are only for transthoracic use, and prototype systems were introduces for intracardiac applications. The intracardiac real-time 3D transducer is incorporated in a 12 F catheter operates at 5 Mhz frequency or operates at 7 MHz in a 9 F catheter. These catheters were found to be feasible for guiding electrode catheter placement in an open chest sheep model. 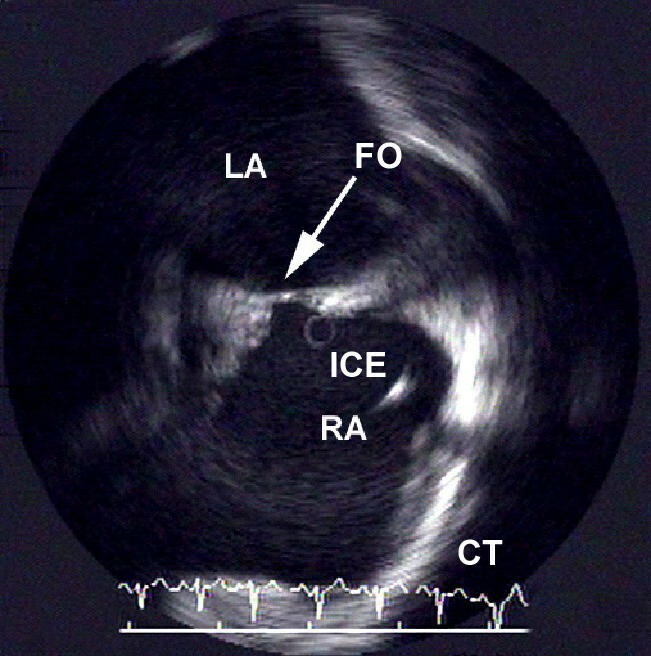 Typical appearance of the interatrial septum with the fossa ovalis recorded by a mechanical intracardiac echo-transducer providing horizontal cross-sectional images. Anatomically and echocardiographically the most prominent part of the atria is the interatrial septum with its very characteristic appearance. It is defined as the thin wall separating the two atria, running obliquely from the front, extending posteriorly and to the right. When it is seen from the right atrium, the most prominent feature is the fossa ovalis surrounded by a muscular rim. When seen from the left atrium, the crater-like appearance of the right side is absent. The membrane in the fossa itself is predominantly composed of fibrous tissue with relatively few myocytes. Certainly its definitive form can be explained by its development, however describing the process of development in details is outside the scope of this review. Although the interatrial septum was a focus of interest for congenital disorders, electrophysiologists have discovered additional reasons to explore the interatrial septum. A significant number of accessory pathways are located septally . Their close relation to the natural atrioventricular conduction system means that direct visualization of the septum can facilitate ablation procedures. Furthermore, left atrio-ventricular accessory pathways can be approached using the transseptal approach, which provides improved stability for the ablation catheter. This requires puncture of the interatrial septum. Although it can be done without direct imaging, data suggest improved safety and increased efficacy using intracardiac echocardiography [10–12]. Another important electrophysiological aspect of interatrial septum is related to the natural conduction pathways between the two atria. These special fibers are located both anteriorly above the fossa ovalis and posteriorly near the orifice of the coronary sinus. Recent data suggest that interatrial conduction delay may play a significant role in the onset mechanism of atrial fibrillation . Therefore stimulation of these regions may play role in preventing atrial fibrillation [14, 15]. To the best of our current knowledge specific electrograms are not informative for these regions. Thus, electrogram analysis can not guide positioning of electrodes in this area. This stimulated the development of imaging modalities for guiding such procedures. Three-dimensional echocardiography proved to be effective for guiding suprafossal pacing . 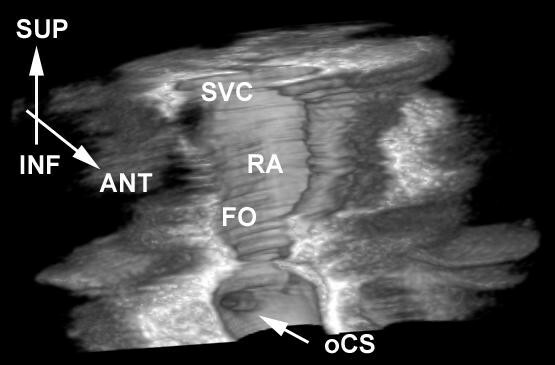 Three-dimensional echocardiographic "en face" view of the ostium of coronary sinus. The coronary sinus (CS) is a small tubular structure just above the posterior left atrioventricular junction. The coronary sinus (CS) is of special interest to the electrophysiologist and pacemaker-implanting physician. It opens into the right atrium between the inferior vena cava and the tricuspid valve orifice. Its tributaries are the great, small and middle cardiac veins, the posterior vein of the left ventricle and the oblique vein of the left atrium (Marshall's vein), all except the last having valves at their orifices. Left atrial recording for electrophysiology (EP) studies is routinely done indirectly from the coronary sinus. The left atrium or the left ventricle can also be paced via the CS [17, 18]. The CS can be cannulated from the jugular, subclavian or femoral vein and insertion of pacing/diagnostic electrode catheters is easy in most patients. However in some patients cannulation of the CS or its tributaries can pose significant difficulties and may result in excessive procedural and fluoroscopy time. Theoretically intracardiac echocardiography (ICE) can identify anatomical variants and may facilitate such procedures . The presence of supraventricular arrhythmias influences significantly the function of the coronary sinus . It is well known that the CS narrows during atrial contraction in persons with sinus rhythm, but does not narrow at all if atrial fibrillation is present . Attenuation of CS narrowing occurs in patients with congestive heart failure. Patients with poor left ventricular systolic function show mild CS dilatation . Greater CS dilatation is present in patients with persistent left superior vena cava, and huge dilatation when this anomaly is accompanied by absence of a right superior vena cava . This has a significant impact on pacemaker implantation for these patients. Apart from its obvious role in providing access to the left atrioventricular junction during electrophysiology testing, the coronary sinus is an important structure for the electrophysiologist. Resynchronization by simultaneous electrical stimulation of both ventricles significantly improves hemodynamics, resulting in increased exercise tolerance and hence quality of life in patients with advanced heart failure and intra-ventricular conduction delay . Reduction in morbidity and mortality was recently reported. This simultaneous stimulation is achieved by positioning of the left ventricular electrode through coronary sinus into its left ventricular side branches. Furthermore biatrial stimulation was also reportedly effective in the preventive treatment of patients with paroxysmal atrial fibrillation . Recently, using cryothermy, safe ablation procedures are possible within the coronary sinus for accessory pathways running in close proximity to this vascular structure . The Thebesian valve guarding the ostium of the coronary sinus. The image was obtained with a 9 MHz rotating mechanical transducer. The Eustachian ridge is very prominent in this patient. In the majority of cases the great cardiac vein possesses a prominent valve where the vein turns around the obtuse margin to become the coronary sinus . This valve was first described by the French scientist R. Vieussens in his book "Nouvelles découvertes sur le coeur" (Paris, 1706). Until recently, all of these anatomical variants are known from post-mortem human studies. A certain level of anecdotal relationship is proposed between difficulties during interventions in cardiac electrophysiology and anatomical differences, but there is no systematically conducted study, which provides direct evidence. One of the reasons is that fluoroscopy-which is an almost exclusive tool for guiding EP procedures- does not allow visualization of anatomical landmarks. Recently, ICE became available providing excellent accuracy in direct visualization of anatomical landmarks including valves serving as obstacles during diagnostic and interventional electrophysiology procedures. 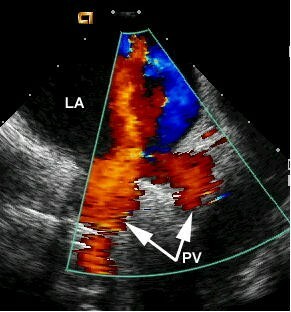 Eustachian valve recorded by a phased array steerable intracardiac ultrasound transducer. The right and left venous valves of the sino-atrial orifice regulate the flow of blood from the sinus venosus to the atrium in fish, amphibians, and reptiles. In bird, mammals and humans, the venous valve loses its hemodynamic function and only comes to medical attention when congenital anomalies occur that are related to it . The right venous valve persists in humans as the crista terminalis, Eustachian and Thebesian valves. 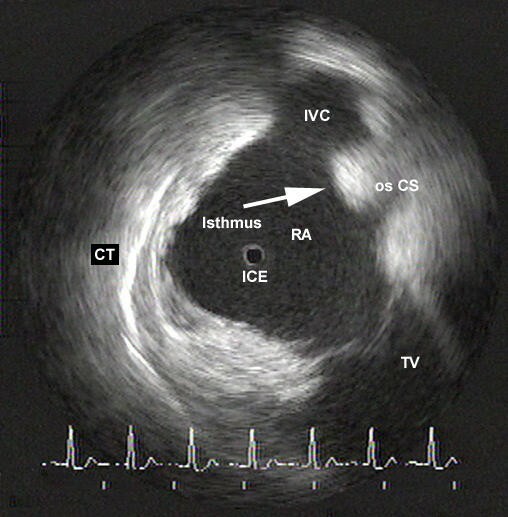 An intraluminal muscle band has been described located inside the right atrium, and coursing in the line of the crista terminalis between the septum spurium and inferior vena cava. This abnormality is possibly derived from the right venous valve. Usually it has a triangular shape and is a flap of fibrous fibro-muscular tissue that is inserted on the Eustachian ridge. The Eustachian ridge separates the orifices of the inferior caval vein and coronary sinus. In some cases the valve is particularly large and can be an obstacle to catheters passing from the inferior caval vein. Occasionally the valve is perforated or takes the form of delicate filigreed mesh. The free border of the valve is called as the tendon of Todaro. This tendon runs in the musculature of the sinus septum (Figure 5). This is indeed one of the borders of Koch's triangle. The detailed information and clinical significance of the Eustachian valve have not yet been elucidated. In the cases of atrial fibrillation with severe tricuspid regurgitation, the valve remains at the semi-closed position throughout systole and opened in rapid filling phase. A small crescentic flap, the Thebesian valve usually guards the orifice of the coronary sinus. Frequently it is fenestrated. An imperforate valve completely covering the ostium is very rare, but can be a major obstacle for positioning electrode catheters into the coronary sinus. The tendon of Todaro reconstructed form a three-dimensional data-set. 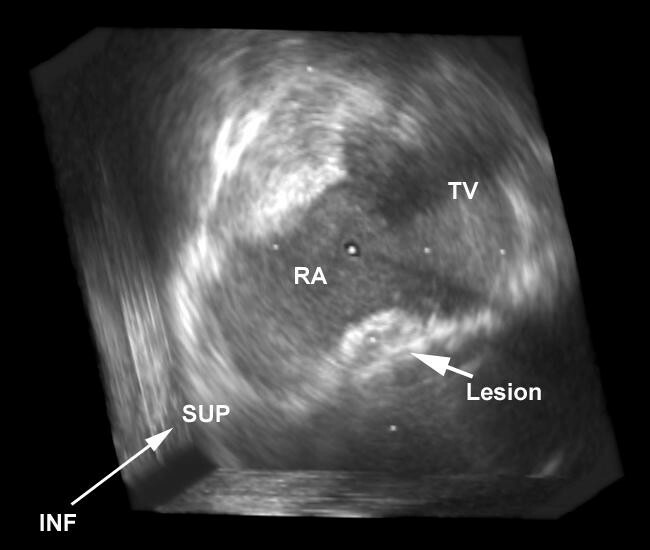 Image showing the bottom of Koch's triangle with an ablation lesion in the area of slow pathway as visualized by echo-contrast infusion. The structures delaying the cardiac impulse and then insuring its rapid propagation to the ventricular myocardium constitute a continuous axis of histologically discrete cells [1, 24]. The atrial components are located at the base of the atrial septum, located at the apex of a triangular region first illustrated by Koch. The anterior border is marked by the hinge of the septal leaflet of the tricuspid valve. Superiorly, the central fibrous body is the landmark for penetration of the bundle of His. The inferior border of the triangle is the orifice of the coronary sinus and the vestibule immediately anterior to it. This part is the area, which is targeted for ablation of the slow pathway in atrio-ventricular nodal reentrant tachycardia. The so-called fast pathway corresponds to the area of musculature close to the apex of the triangle. Ablation in the Koch's triangle was of special interest in the last two decades. Large number of patients with supraventricular tachycardia have an AVNRT. The occurrence of inadvertent complete AV block is an infrequent but serious complication . Imaging of this region using intracardiac echocardiography is not particularly difficult, because of the very characteristic appearance of the borders. Intracardiac ultrasound was reported during AVNRT ablation to improve the outcome of the procedures. During cryo-ablation of the AV node the cryocatheter-endocardial contact and ice-ball growth could be effectively monitored with ICE . From the epicardial aspect of the right atrium a fat-filled groove structure can be seen at the lateral wall. This structure corresponding internally to the terminal crest. Close to its origin the terminal crest is joined to by a prominent bundle called septum spurium. The terminal crest sweeps like a twisted "C" originating from the septal wall, passing anterior to the orifice of the superior caval vein, descending posteriorly and laterally and then turning anteriorly to skirt the right side of the of the orifice of the inferior caval vein. 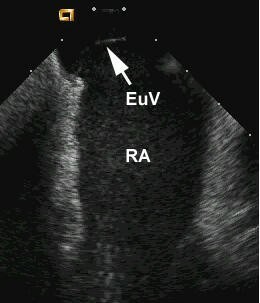 The echocardiographic appearance of the terminal crest is very typical; it can be visualized along the lateral wall as a very echo-dense structure. The complexity of atrial geometry is responsible for the fact spread of activation from site of the origin of the electrical impulse is restrained by natural barriers and orifices. It has been suggested by numerous reports that the terminal crest can serve as such a physiological barrier and therefore can play important role in some arrhythmia mechanisms [27–30]. From the electrophysiology point of view it is a transverse barrier to conduction during typical atrial flutter. The above mentioned findings support the idea that direct visualization of the terminal crest may facilitate certain types of transcatheter ablations. Since mapping techniques have proven that atrial tachycardias can originate from the terminal crest, visualization can improve the outcome of these procedures . Using intracardiac echocardiography a subgroup of so-called "crista tachycardias" were identified . ICE guided ablation of such tachycardias were highly effective. ICE facilitated both positioning of mapping multipolar electrode catheters along the crista and mapping with the ablation catheter. From these studies it was concluded the approximately two third of the atrial tachycardia originating from the right atrium are anatomically associated to the crista terminalis. Most importantly direct imaging of the terminal crest has a substantial role during ablation of inappropriate sinus tachycardia [32–34]. Because of the vicinity of the sinus node to the epicardial surface at the junction of the superior vena cava and the right atrial appendage, the sinus node is easily damaged if an epicardial approach is used during surgery. If an endocardial approach is used however more energy is needed to penetrate the greater musculature of the terminal crest and additionally the centrally located nodal artery has a cooling effect reducing the damage. From the anatomical standpoint it is suggested therefore, that positioning the ablation catheter at the site of the terminal crest halfway between the caval veins, where the tail of the sinus node is intra-myocardially located is effective without the risk of causing venous occlusion [34, 35]. 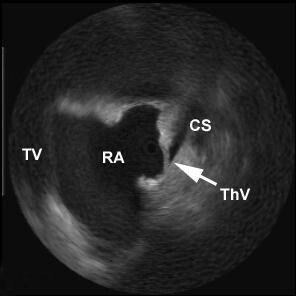 Image of the cavo-tricuspid isthmus in a patient who underwent ablation of typical atrial flutter. The atrial wall inferior to the orifice of the coronary sinus is usually pouch-like. It forms the posterior part of the so-called "flutter isthmus" between the inferior vena cava and tricuspid valve. Three morphological zones are usually distinguishable in the flutter isthmus. It receives a variable number of muscular branches with varying morphology from the crista terminalis. The isthmus of atrial tissue bordered by the inferior vena cava and the tricuspid annulus forms a critical zone of slow conduction in the reentry circuit of atrial flutter. Animal models and mapping studies of human atrial flutter have proven the importance of barriers in this reentrant arrhythmia . The consistency of rate and morphology of typical atrial flutter suggest a common anatomic substrate for this arrhythmia. The unique endocardial architecture of the right atrium provides anatomic barriers around which reentry occurs . In typical human atrial flutter, the crista terminalis, Eustachian ridge, and tricuspid annulus have been identified as barriers to conduction. 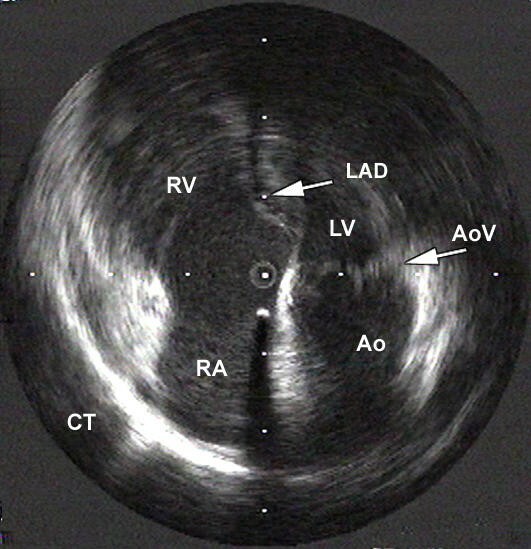 Visualization of the pulmonary veins from the right atrium using a 5 MHz phased array intracardiac echocardiography transducer. The pulmonary venous wall in the human comprises a thin endothelium and media consisting of fibrous tissue and smooth muscle, with or without an irregular middle layer of atrial myocardial tissue, and thick fibro-fatty adventitia on the outside. The presence of myocardial sleeves extending from the left atrium onto the pulmonary veins towards the lung is well documented [36, 37]. This atrial myocardium, with bundles arranged in varying orientations passes between the adventita and the media of the venous wall. Theses muscle sleeves are believed to have role in the pathogenesis of atrial fibrillation providing triggers. These left atrial pulmonary vein muscle sleeve connections are targeted during isolation of the pulmonary veins [38–40]. Currently the pulmonary veins are visualized by angiography during the procedure, and the procedure is guided by electrogram analysis. Low frequency ultrasound was used to detect post-procedural stenosis after ablation, which is the most severe complication of the procedure. Intracardiac echocardiography is proved to be useful technique during ablation of pulmonary veins in guiding positioning of the ablation catheter and allowing visualization of appropriate tip-tissue contact [41–43]. Unfortunately these low frequency echo-transducers provide useful information about the vein, but do not allow detailed study of the structure of the venous wall. Recently, convincing data have been presented with high frequency intravascular ultrasound in visualizing such structures . Correct identification of the anatomy is important since significant variations exist including a common vestibule of the left pulmonary veins and additional small branches. ICE has a critically important role in ablation in this region. First, the transseptal puncture can be guided by ICE. 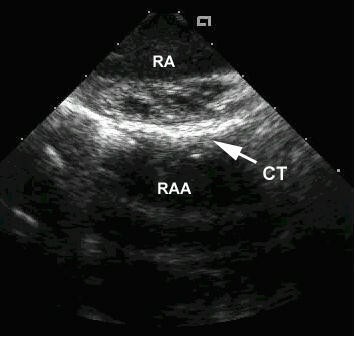 Pulmonary venous anatomy can be assessed using the phased-array transducer without entering the left side of the heart. During ablation the wall contact of the catheters can be monitored . Knowing the fact that pulmonary vein stenosis is the most frequent and potentially life threatening complication of the procedure, one of the major advantage of ICE appears to be that after ablation pulmonary vein stenosis can be reliably assessed using vessel diameter measurement and Doppler flow measurements . Recent reports suggest that pulmonary venous anatomy can be extensively studied by 3D intracardiac echocardiography, including visualization of ablation catheters in the vein. LV outflow tract visualized using a 9 Mhz rotating transducer place at the level of the tip of Koch's triangle. The left ventricular outflow tract can be visualized by using intracardiac echocardiography, without additional arterial puncture or transseptal puncture . The ultrasound catheter should be positioned on the anterior interatrial septum (His bundle region) or at the base of the right ventricular outflow tract. The ostium and the initial part of the left main coronary artery can be also visualized which allows safe ablation in this region. It was demonstrated that in patients with idiopathic left ventricular tachycardia originating from the left ventricular outflow tract intracardiac echocardiography could accurately guide catheter ablation by permitting the identification of anatomical landmarks, endocardial contact and ablation electrode movement . Using intracardiac ultrasound the aortic root and the tip of the ablation catheter could be visualized in details. Interestingly enough the ablation site was always safely above the coronary cusp. In conclusion, clinical electrophysiology had significant benefit form the latest developments in echocardiography. Intracardiac transducers are now available, and this allows better intracardiac structure identification. The clinical application of these devices is a subject of ongoing studies. The results are very promising, and with further improvement in imaging the electrophysiology procedures will require significantly less fluoroscopy time with increased accuracy and efficacy. Safety of the procedures will be substantially increased. This aspect will be increasingly important since the radiation burden – and the associated long term oncogenic risk – is not negligible with cardiac electrophysiology procedures, which usually involve a substantial radiation exposure, corresponding to several thousands of chest X-rays and long-term oncogenic risk [48, 49]. Intracardiac ultrasound – still in its infancy – looks extraordinarily promising in this aspect not only to improve the acute diagnostic benefit, but – what is probably much more important – also to improve the risk – benefit ratio of currently employed diagnostic and therapeutic electrophysiologic procedures.